With modern digital cameras is it relatively easy to get decent startrail-images. Instead of taking one long exposure one can take many shorter exposures and combine them in Photoshop using layers in "lighten"-modus. The big advantage is that the background heaven will stay as dark as on the single exposures. My procedure: When visual observing with my 12" dobsonion style Newton telescope I usually can't resist taking some startrails. I put my Canon 10D on a tripod with a wide angle lens at maximum aperture. Camera is set to ISO 400 at an exposure time of 30s. 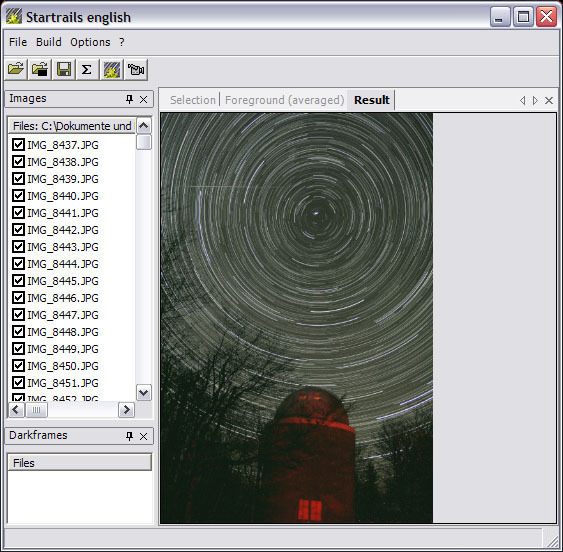 This is why I decided to develop the "Startrails.exe"
You can load the Images and optionally some dark.frames (will be averaged and subtracted automatically if exist). If there are some images you don’t want you can uncheck them. Of course this feature can be used to create any time lapse movie, not only starmovies..
As it is developed in C# you need the Microsoft .NET framework installed. If you use Windows XP, Win 2000 or Windows 7 with automatic updates enabled the .NET framework should be installed. 29th July, 2013:New: Falling stars! Russian translation, thanks go to Igor Sokalski ! Italian translation, thanks go to Matteo Consolati! Turkish translation, thanks go to Gorkem Koray Oz! Bulgarian translation, thanks go to Mihael Yovchev! Portuguese translation, thanks go to Nuno Santos! 5th November, 2012: French Version! Thanks go to Ulrich Schüly for the translation! 29th August, 2012: Version 2.1! 1th May, 2012: Version 2.0 is here! 18th March, 2012: Dear friends of Startrails, I am really overwhelmed how many people are interested in the software. As you can see in the history log below, last update was back in 2005. But now I am really encouraged to make a major update.